Windmills have been really succesful last years. Windmills are maybe the main flagship for renewables (if we forget hydropower, ussually excluded by all parts from the discussion). They have been the cheapest renewable energy so the cost argument should be less important for them. However, they are one of the favorit targets for skeptics (here for example). Why? 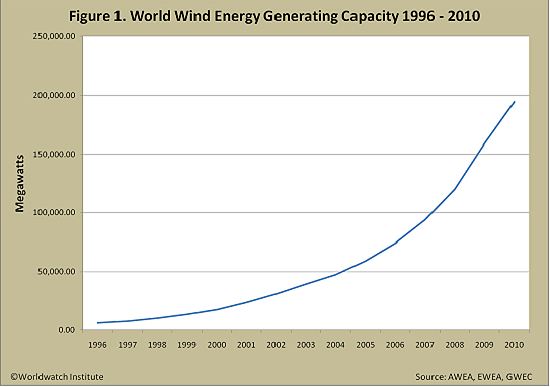 Maybe becuse wind powers success, next figure shows the strong upwards slope in the world in last years. In Spain it produced more than 5000 GWh in April, more than 25% of total electricity, getting a maximun of 61% of total electricity production at 1:30 hours of April 19th;in the whole 2012 it is a 17.5% up to now. Really important figures that worry deniers and make me hopeful. Some renewables are not only getting actual producers, they are getting important shares in electricity production. A real world electric car, more or less: Twizy.